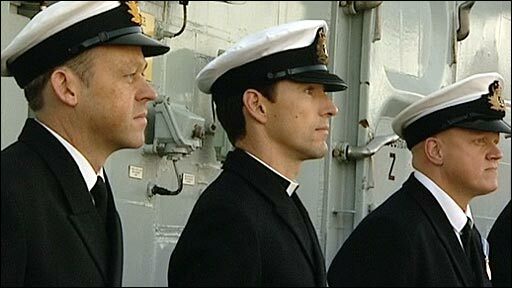 Royal Marines who shot and killed two Somali pirates in November acted lawfully, an inquiry has found. HMS Cumberland, based in Devonport, was on deployment in the Gulf of Aden when the marine detachment intervened in an attempted hijacking of a Danish ship. As the Type-22 frigate and its crew sailed back into Plymouth earlier the findings of the Ministry of Defence (MoD) inquiry were made public. It found that all personnel had acted lawfully and in self-defence. During the stand-off a Yemeni man on board the pirate boat was also injured and later died, in spite of emergency treatment by HMS Cumberland's doctor. Eight pirates were captured and are due to stand trial in 2009. Sailing into Plymouth earlier, officers on board HMS Cumberland revealed some of the Kalashnikov assault rifles, rocket-propelled grenade launchers and pistols which were confiscated from pirates during the ship's four-month deployment in the Gulf. 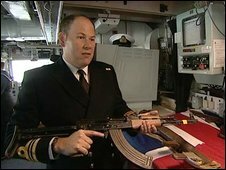 Lt Cdr Steven Wall said: "The assault rifles are very commonly used in piracy. "There are lots of these weapons around, they are fairly easy to get hold of and very simple to use." Lt Chris Jones said: "The deployment has been very challenging in what we've done and what we've achieved. "I'm looking forward to chilling out after a really hectic three or four months. "We are glad to be home because we know there are lots of people still out on operations." 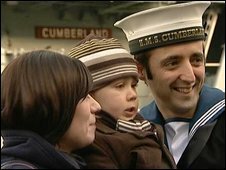 Linda O'Brien, from Birmingham, was on the quayside in Plymouth with her young son to welcome back her partner, ship's chef Chris Vernon. "I've missed him so much I've been counting off the days on the calendar waiting for him to come back," she said. "I just can't believe the day's here."